Don't let the similarities between cucumbers and zucchini confuse you. Even though both cylindrical vegetables are dark green with white flesh, they are distinctively different species. Both cucumbers and zucchini belong to the Curcurbit family, which also counts gourds, melons, pumpkins and squash among its members. Cucumbers and zucchini differ both in how people commonly eat them and in their nutritional values. 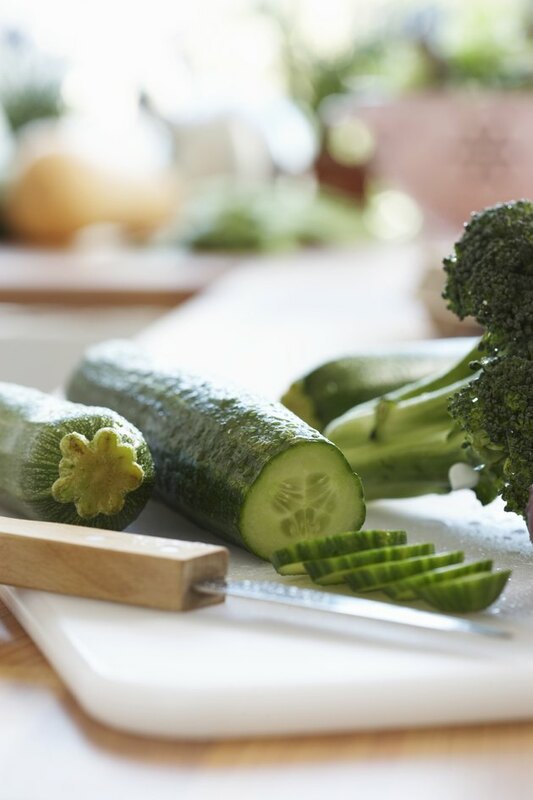 People almost always eat cukes raw, while zucchini is more often cooked. A cup of sliced, unpeeled cucumber contains 16 calories, while a cup of sliced, unpeeled zucchini contains 19 calories. You'll get 4 g of carbohydrates, .5 g of dietary fiber, less than 1 g of protein and .1 g of fat from eating a cup of cucumber slices. A cup of zucchini slices provides 4 g of carbohydrates, 1 g of dietary fiber, 1.4 g of protein and .4 g of fat. A cup of zucchini slices provides 27 percent of the recommended dietary allowance, or RDA, of vitamin C for adult women and 24 percent of the RDA of vitamin C for adult men. The same amount of cucumber slices provides less than 5 percent of the RDA of vitamin C. You'll get 14 percent of the RDA of vitamin B-6 from a cup of zucchini slices, but only 3 percent of the RDA of vitamin B-6 from a cup of cucumber slices. A cup of sliced zucchini has 6 percent of the RDA of potassium; a cup of sliced cucumber provides half that amount. A cup of zucchini slices provides 5 percent of the RDA of iron for adult men and 2 percent of the RDA of iron for adult women. The same amount of cucumber has 4 percent of the RDA of iron for men and 2 percent of the RDA of iron for women. Both of these low-sodium veggies provide about 2 percent of the RDA of calcium. Wash cucumbers and zucchini before slicing them by running them under tap water for at least 30 seconds while rubbing them. This removes most potentially harmful trace residues from pesticides, as recommended by the Connecticut Agricultural Experiment Station. Eat both vegetables without removing their skins whenever possible, since the skins of cucumbers and zucchini contain a portion of their dietary fiber, vitamins and minerals. University of Nebraska Department of Horticulture; Cucumber Crop Information; Sarah Browning, et al.